After happening upon the 2048 game by Gabriel Cirulli I quickly became totally obsessed. First I got obsessed with getting to 2048. Then I got obsessed with getting to 4096. Then I figured, “Hey. 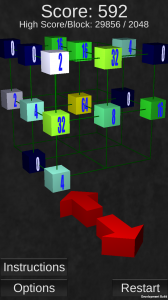 Wouldn’t this be fun to play in 3D?” Previously I had been fooling around with the Unity3D game engine in preparation for a workshop at the O’Reilly Fluent Conference (which ended up being cancelled), so I thought I would use 2048 3D as a way to get familiar with it. So after a side trip into the world of Blender I finally got this (mostly) working and you can go ahead and play by clicking the arrow below. Because it was way too easy to get to 2048, I also added zeros to make it a bit more challenging. Please feel free to give me any kind of feedback. I have also set this up as an open source project on Github which you are more than welcome to contribute to. For those of you lucky enough to have an android device you can download this from Google Play at the following url. For playing right here click the image below.